The history of the Yashinon name had it's beginnings as Yashima. This was derived from "Yoshihama" the Japanese word for the 8 Islands which comprise the nation. This was also the origin of the Yashica brand. The Yashica Rangefinder Heritage dates to earlier Leica look-a-like Yashica branded models YE and YF that were manufactured by Nicca [Nippon Camera Works]. A beautiful example of the Nicca workmanship can be seen in the Nicca III S depicted here, mounted with a Nikkor lens that has the original Leica Thread. Thanks to John Corneille of Australia for the photos of the Nicca. 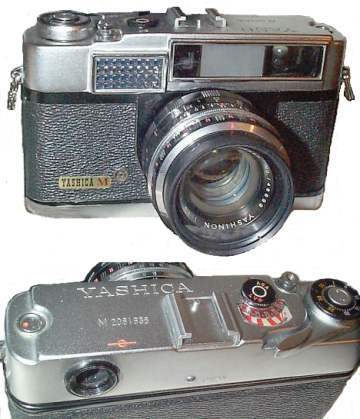 Nicca was eventually purchased by Yashica in order to get this old line precision works on the fast track to producing it's own rangefinder camera that would carry the Yashinon lenses. The company's earliest link was established in 1924 by Masashige Tomioka as the Tomioka Optical Laboratory, in Ogawa-machi, Ebara-ku, now Tokyo. In 1949 the company was reorganized as the Tomioka Optical and Machine Manufacturing Co., Ltd., in Ome, Tokyo with a capital of 200,000 ¥. In 1968 the corporate capital source of this venture changed it's name once again from Japan Film Machines Co., Ltd to "Yashica Co. Ltd". This brought the company name in line with the Yashica and Yashinon brand names that had been established since at least 1958 that I know of. We are fortunate to be able to display an image of the Yashica YE that was was kindly provided by Pacific Rim Camera. 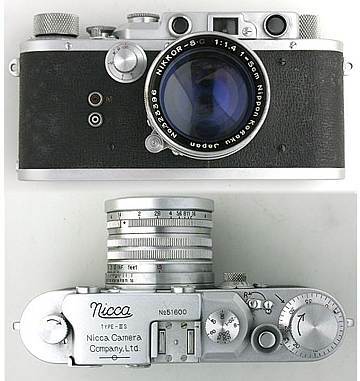 Notice the vastly improved film advance mechanism lever over the earlier Leica design. 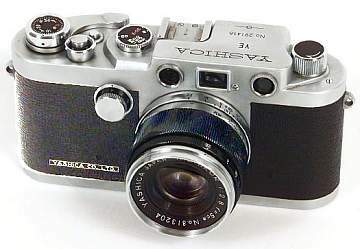 The Model 35 camera depicted here is the first of the Rangefinder models to have been produced in the intergrated Yashica Works. The General Manager of the reorganised company was Mr. Agucho, known on his visits to the States as "Harry". This camera is the first implementation of Mr. Agucho's vision to produce a quality rangefinder camera, which the masses could afford. The barrage of subsequent models which emanated from the works until they found the winning formula in the Electro, is astonishing. The date of introduction of the Yashica 35 was 1958. It features a non interchangeable Yashinon 1.9, 45mm lens, set in a Copal MXV shutter. The lens stops down to 16. The shutter speeds range from 1 sec to 1/500th with "B" for extended time exposures. A 2.8 version was also offered. The back cover swings open to load and is virtually unchanged through the subsequent Electro G series. Only the odd exterior door latch was dispatched with. This mechanism is depicted with the cover plate removed. Images of this model were kindly provided to us by Ozdak in Australia. Note that the top plate is marked "YASHICA Co., LTD" at the rear right top. 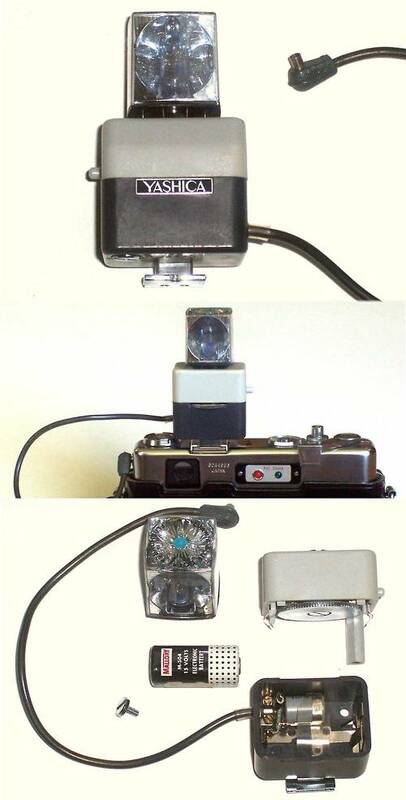 A fair quantity of these cameras were first released with the top plate marked as "YASHIMA OPT IND Co., LTD" as shown in the image very kindly provided by Alberto Polak of Canada. By the time that the MG-1 was introduced in 1975 it became clear to the company that trying to compete with the Single Lens Reflex camera with their interchangeable lenses was futile. The SLR Pentax K1000 body with an 2 interchangeable lens could have been purchased new by an astute shopper for under $100 US from a Grey Market importer. Only a camera with features that could command a price that would support both the maker and an enthusiastic dealership, could be a viable product. In an astute and unique partnership, the legendary Contax now built by Yashica was reborn. In October of 1983, Kyocera merges with Yashica. It is the end of a golden era. On March 1, 2005 my email in-box started to flood with messages that Kyocera was abandoning the Yashica brand and Contax manufacture. As it turns out this was just the first abandonment of the 35 miniature camera format, so the chances of a Yashica or Contax film camera rebirth is virtually nil. On January 12, 2006 the New York Times reported ' Nikon, the Japanese camera maker, said Thursday that it would stop making most of its film cameras and lenses in order to focus on digital cameras'. Reuters Published: January 19, 2006, 5:06 AM : Konica Minolta Holdings will withdraw from the camera and film businesses. marking the end to one of the best known brands in the photography world. The company said Thursday it will sell a portion of its digital single lens reflex (SLR) camera assets to Sony for an undisclosed sum and cease production of compact cameras by March of this year. The company said it will stop making photographic film and color paper by March 2007, pulling out of a market in rapid decline due to the spread of digital cameras. Konica-Minolta, was created in August 2003 through the merger of Konica and Minolta. Konica has a long history in the camera and film markets, producing Japan's first photographic paper in 1903 and the country's first color film in 1940. In June of 2009, Mary Jane Hellyar, president of Kodak's Film, Photofinishing and Entertainment, announced the plan to retire Kodachrome film manufacture. Kodak estimates that current stock of the film will be on store shelves no longer than the fall of 2009. Dwayne's Photo in Parsons, Kansas the only lab in the world still processing Kodahrome will continue to process the film though 2010. Available in one form or another for the past 74 years, the passing of Kodachrome may signal the coming demise of film as a medium in the not to distant future. Makes you want to break out in a chorus of Paul Simon's "Mamma don't take my Kodachrome Away". As predicted, Dwayne's Photo, in Parsons, Kansas, developed the last rolll of Kodachrome on Thursday, December 30, 2010. Many people are unaware that Kodachrome is a Black &White film that coverts to color through couplers that absord dye in the developing bath. These dyes are no longer being manufactured. Anyone with a stash of Kodachrome can process it or have it developed in a conventional fine grain B &W developer bath and achieve a first rate B &W negative. This was commonly done during WWII when amateurs were unable to obtain Panchromatic film and bought Kodachrome on the black market [probably pilfered from military supplies] and developed it at home. I am sure most of the visitors to this site never thought that they would ever see this day. On the morning of Thursday, January 19, 2012, Eastman KodaK filed for Chapter 11 Bankruptcy Protection. Founded in 1880 by George Eastman, the company introduced light sensitive media coated on a flexible substrate that could be made to any length, thereby enabling the capture of multiple images without the need to first change the glass plate "film" in use by photographers of the day. Affiliates outside the USA were not affected by the filing. Leica 35mm camera' breaks world record at auction. 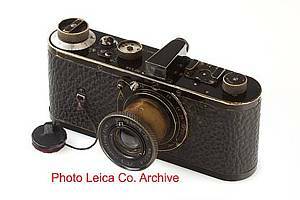 VIENNA, Austria--An early Leica model 0 camera prototype made in 1923 went under the hammer for US $2.79 million ( 2.16 million euros ) at auction - a new world record for the most valuable camera to date, according to the World Records Academy: www.worldrecordsacademy.org/. 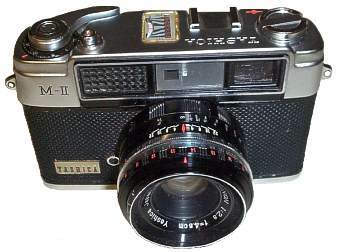 Yashica introduced the YK in 1959. 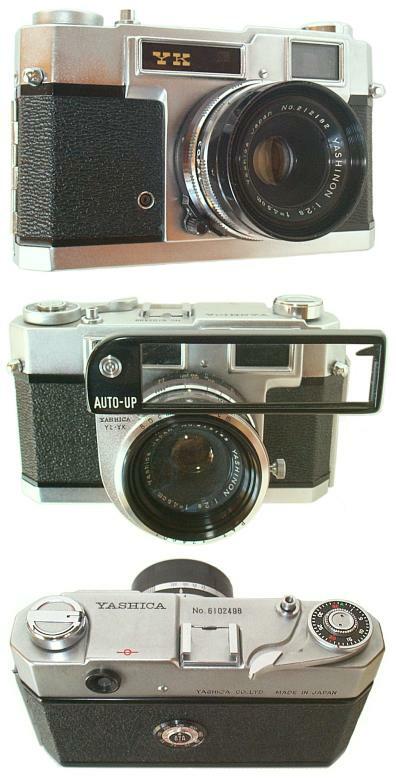 This camera is clearly decended from the first model and features a modest Copal Shutter. The YK has the same Yashinon  2.8 aperture 45mm focal length lens as available on the YL and shares the same 46mm accessory thread. The range of focus is from 1 meter [39.3696 inches] to infinity. It features a convenient handle on the focus ring. The marked shutter speed settings are 'B' 1/30 1/50 1/100 and 1/300th top speed. There are no detents at these settings. Sharing the same lens as the YL allows the Auto Up Adapter shown here to be used on either camera as well as the later YM [Minister 1 & model D]. This enables the camera to focus close-ups within a range of 45cm [18 inches] and 80 cm [32 inches]. The adapter attaches to the prime lens with a set screw which compresses a spring steel sleeve which grips totally around the lens. The sprocket release is mounted on the base of the camera exactly as in the YL, and is marked 'A" and "R' for Active & Release, at both ends of it's rotation. The back view shows an ASA dial ranging from 10 to 1600 as well is the DIN speeds, which can be set to remind the user of the film that is loaded in the camera. This is visible even when the camera is mounted in the case through a circular plastic port . As seen in the rear top view, the focal plane of the film is designated with the symbol -o- to enable very precise focussing of close objects. I think that you will agree that this is an improvement over 'Japan Film Machines, Co., Ltd.' which was the registered name of the investment group which financed the takeover of Nicca. The year 1959 also saw the introduction of the radical model YL, and gives us the first clue of the companies strategy to use parallel design teams. This camera is in no way an extension of the first 35 design, and as we can see in the coming years the simultaneous release of dissimilar models, bears this out. We are once more indebted to Australia for these ©images by Paul Mason. This camera has a parallex compensating viewfinder which is a feature missing from the more basic YK. The finder has a split image rangefinder of excellent clarity built in. No need to shift eye positions to focus. The Yashinon 45mm 2.8 lens, is mounted in a Copal MXV shutter. It was also available with an 1.9 lens with a Copal SVL shutter. Speeds range from 1 sec through 1/500th and a Bulb "B" setting for time exposures. A self timer is also provided. The stepped top design of the new Voigtlander B and Contax G2 seen to the right, bring to mind the Peter Allen lyric, "Suddenly everything old is new again". If you are wondering what happened to the rewind crank, it isn't missing. In what has to be ultimate victory of the body contour design team over the engineers, the crank is mounted in the base, from which it pops out for use. Shades of Detroit ! The left side of the bottom reveals the recessed ergonomic styling that facilitates opening the rear door. This design is carried forward to the GT model [shown further down] where it disappears in mid production with no model change designation to the camera. The view of the bottom plate also reveals the convenient handle on the focus ring. I really miss that in the later models. To the extreme right the sprocket release control is visible. When this is turned to the 'R' [release] position the wind handle pops up, and can be folded open. To return the handle, set the dial to 'A' [active] fold down the handle, line it up with the well, and push in gently. The self timer can also be seen. The rear view displays the clean cut 'step top' styling. We were fortunate in getting our hands on a YL shortly after the images above were made available to the site. This has made it possible to tear down the camera and give you a glimpse of the way the crank is connected to top of the camera. There are 3 gears located under the rangefinder assembly, which tranfer the motion to the cassette rewind interface. Needless to say, this extravagant design could not continue for long, and when the parts ran out with the production of the interim model M, that was it! If you are fortunate to be able to add one of these to your collection, you will find it a joy to use. The year 1960 saw the extention of this design in the model M a.k.a Minister I. This is the signal move to an on-board exposure meter. The images were kindly made available by LKantiques. The camera as shown has a Yashinon 45mm lens with a maximum aperture of 1.9 and stops down to 16. Flash synchronization is available for flash bulbs at 'M' or Strobe at 'X' setting. 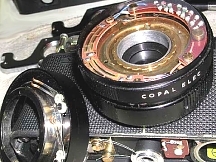 The Copal shutter has 10 speed settings ranging from 1 second to 1/500th plus 'Bulb'. A version with a 45mm 2.8 lens was also produced. 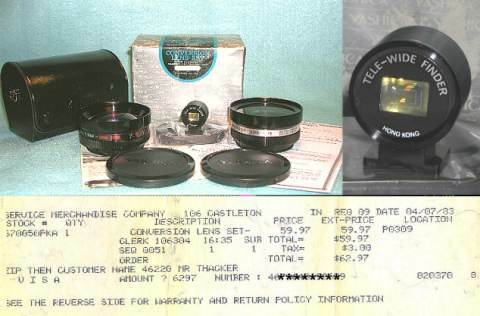 These two lens / shutter combinations are the same as those used with the YL described above. At first glance this camera appears to be missing it's rewind knob, but the M features the same recessed bottom plate, pop-out rewinder and sprocket release as the YL. 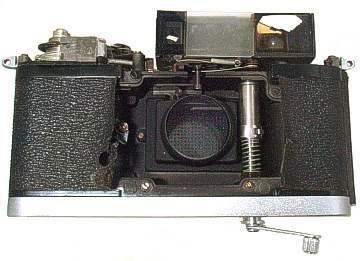 What was different, is the inclusion of a self energised Selenium photo-electric cell powered exposure meter, which levelled out the top plate. Note the round indicator to the left on the top view, which confirms that the film is moving when the advance lever is activated. This indicator is required so that one can tell if the film is taking up, since the tell tale turn of a wind lever is absent. The meter does not control the shutter or camera in any way. In 1962 the introduction of the MII both simplified the construction of the M and brought the camera's look into the mainstream, by moving the Rewind Crank to the top plate. The MII otherwise matches the performance of it's predecessor with the same lens / shutter combination. Thanks to Russ Henley of BC, Canada for this shot of the M2. See the Minister D shown elsewhere on this site, for how the meter sensor and swing needle indicater interact. While those early cameras were in the design stage, a most remarkable break-through occurred. On September 12, 1958, Jack St. Clair Kilby, working at the Texas Instruments labs, finally got his circuit on a single chip to work, and the Intregrated Circuit was born. 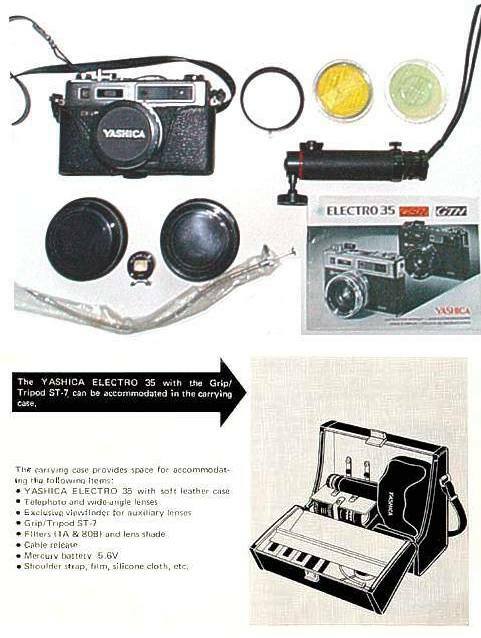 Yashica was the first camera maker to use an IC with the introduction of the Lynx 5000 in the year 1968. The "G" series that followed took this to the next level. Welcome weary Traveler.... at last ....you have reached the "Holy Grail" of Yashica Collectors. For the first time ever published, we present the highly prized Yashica Gold. This image © is of a Yashica GTN which was presented to the distributor who purchased the five millionth camera of the G series. The ceremony was held at the Yashica Works in Japan, and the recipient was flown there by the company for the presentation. All told 15 of the Gold cameras were produced for presentation to dignitaries or to mark special events. The actual camera depicted here was presented to Yashica Guy on December 25, 2001. The cr�me de la cr�me, is the single camera produced with a Gold shutter and matching golden coloured buckskin covering. As magnificent as that camera is, it is limited to using monochrome film unless of course one wanted to go through life photographing the world through gold coloured spectacles, due to the internal reflections within the optics. Remarkably, by the end of production of the G series, a total of eight million of these outstanding cameras had been produced. The golden Canadian Loony sent in by a friend from Vancouver, BC is the perfect companion to the Gold Camera as a battery cap tool. In reality the camera's battery cap slot is milled to be a perfect fit for the 100 ¥en coin. If you are wondering where your own camera fits into the scheme of things, be aware that the number on the camera is not a consecutive serial number. Like the tag on the inside of the door of your car, the Yashica number indicates the date of manufacture and other possible specifics of the assembly team and parts. So far, trying to find a former plant employee who might remember the code, has run into a dead end. One of the most surprising features of the Yashica Rangefinders was the ready availabilty of a Black Enamel finish version for a mere pittance more than the Chrome issue. So highly prized is the black enamel finish among the Leica crowd, that Shintaru Yaghinuma provides a service wherby he strips the chrome off the bodies and repaints them with black enamel. After removing some of the paint to show the brassing of a well employed camera, [ala stone pre-washed jeans] he bakes the finish on. The whole process including return shipping from Japan runs $500.00 US. The Yashica Professional shown undergoing restoration, is extremely hard to find in good condition. 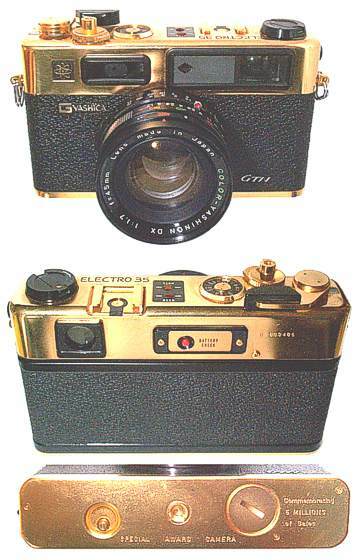 Note that the sculptured bottom plate, & the skin match the original Electro 35. The battery cap shown, is oddly not black. In case you are thinking that the cap was replaced, the illustration on the left from the Yashica manual, confirms that it is as the original. Yong Yang advises that he has versions with both 12 - 500 and 25 - 1000 ASA scales. Aside from the 'Pro' Black Finish, this camera is similar to the first G model. At some point the Pro received the gold plated contacts that were not promoted until the introduction of the later Gold Mechanica GT. The Gold Plated 'dual finger contact' can clearly be seen on the lens barrel assembly part of this Professional in the image on the right. This specific example has the early 400 ASA scale. The Switch image is provided by Lynn Sellers. The camera accepts a version of theYashica Guy Pro Battery Adapter, so don't be concerned that the mercury battery that came with it, is no longer available.. The two images of the 'Pro' in work are © Miguel Azar, and we wish him luck on his project. The earliest known 'Professional' seems to have been a market test. Instead of the logo on the front, it sports a Professional decal on the rear. It also has 4 screws holding the bottom plate instead of the 3 screws found on all later models of the 'G' series. 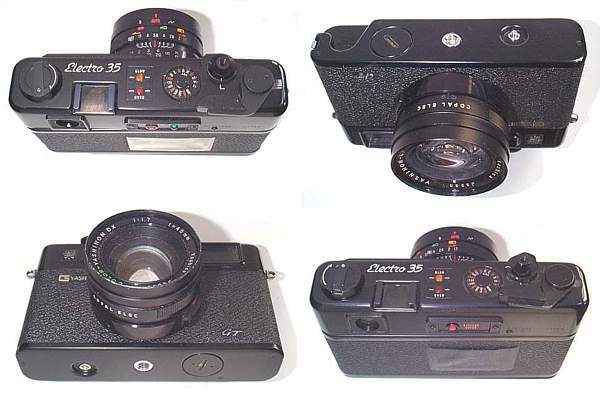 When the 'Variations' page was created, the plan was to show some of the minor design changes as a camera model matured, with special emphasis on the GT. In my wildest imagination I had never anticipated that a GT could have morphed into an Oral Eye. This truly astonishing feat was pulled off by Yashica with exclusive marketing world wide being undertaken by Tokyo Shizaisha Co. Ltd. a leading manufacturer of Dental Equipment. The f/4 55mm macro lens is composed of 4 elements in 3 groups. In actual use it stops down to f/16. The lens assembly incorporates a ring flash. The Aperture / Flash Output is preset for the use of ASA / ISO 64 film. A neutral density filter is provided for use with ASA / ISO 100 film. The spacer arm is attached to the camera by means of the regular tripod socket. With the arm removed, face and neck photography are possible using a guide stick to make sure that the camera is held 70cm from the target. The 70cm setting on the lens rim must be lined up. A close up of the logo that replaces the familiar 'GT' on the bottom front right of the camera, is shown below, courtesy of Michael Baker who also provided some insight into the use of this camera. The handle hold 4 AA cells and is wired into the body. An AC / DC battery eliminator is part of the package in case the batteries die unexpectedly. The panel that screws onto the tripod socket extends out front of the camera to indicates the lens focus setting required for the use of one of the 2 metal frames that can be attached upright to the front of the panel. This frame when placed in contact with the patient's mouth, defines the target area. To shoot beyond the target area, the distance inside the mouth must be set on the focus scale. The circle on the top of the camera that would ordinarily be the ASA film speed dial on a GT is a 'Flash Ready' light indicator. I am indebted to Larry Shapiro of LA for making the camera images and a scan of the manual available. The enhanced image renderings are © 2005 by Yashica Guy, as is everything on this site, and may not be used on web auction offers. It is possible to split hairs and probably find endless minor variations in the Yashica G Series. The variations shown below are hardly minor, but pale in the endeavor to transform a GT into than Oral Eye. First we see the early GT depicted which retained the door release latch, on the bottom plate, and at the same time continues the battery check button and lamp group together as in the early G brushed satin chrome model. 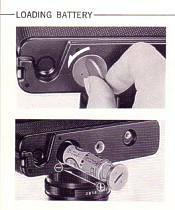 To open the back for loading, pull back the small lever until it is in line with the baseplate of the camera. The travel is only about 1mm. When the light & dust seals are new or renewed, the door may not pop open until the seals configure themselves. In this case retract the lever with a finger nail of one hand, while using the thumb and two fingers of the other hand to grasp and open the door. The ergonomic design of this model, facilitates this. Be sure to close the door firmly after loading, and make certain that the locking lever is fully inward. This camera has a scale to ASA 500. The lens is marked Yashinon COLOR while the flat bottom plate version adds the DX designation. The next image shows the full view. This is followed by the later GT which has the combo rewind handle / door release. This model like the later GS brushed satin chrome model, has discontinued the test lamp. Both of these cameras shown were made in Japan. If purchasing a camera by mail, you may wish to know exactly which version is on offer. There is no model designation to distinguish between these two very different cameras. 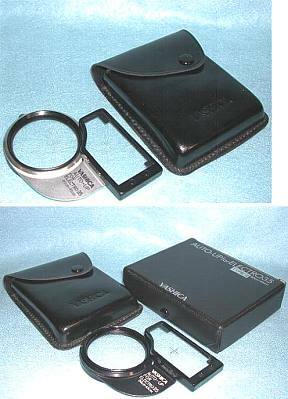 The later model most often has a scale to ASA 1000. Both cameras have an imitation leather skin. As if these drastic variations were not enough to confuse the prospective buyer, there is an early model GT with the recessed base that has an ASA scale to 400 and Christian Harkness writes that he found one of these Japan made examples with an ASA 500 scale. The later model as shown below it with the flat base-plate has an ASA dial to only 500. Many purchasers of the Yashica G models were fortunate enough to have opted for the "Kit". This special purchase included a Keyed Locking Hard Case which held the camera in it's ever-ready case, a set of Wide / Tele accessory lenses with a matching clip-on finder, a metal mesh clad cable release, a rigid metal or rubber collapsible sunshade which varied with camera models, the Mini Tripod, and 2 filters that also varied with the particular camera. One of the filters included with earlier cameras was the 80B used to enable daylight balanced Kodachrome to be shot with photoflood lamps. A yellow filter to bring out the clouds against a blue sky with Black & White film was sometimes part of the package, as well as an Ultraviolet filter particularly useful for shooting with colour negative film, because UV light can penetrate all 3 layers of the film emulsion resulting in "fog". The Yashica ST-7 combination handgrip and table top tripod is remarkable in the fact that was manufactured in Germany. The legs fold up and are contained within the hand grip. A swivel head permits it to be used for steady support when held against a pole or wall, especially convenient for long exposure times, without drawing attention to the photographer as a standard tripod would. Coupled with a black finish camera, it allows candid camera shooters to blend into the background. The newer version of the Yashica ever-ready camera case has a larger locking knob with two slots in it. This was designed to permit the use of a leg removed from the ST-7 to engage in this slot to make it easier to unscrew the Grip / Mini Tripod from the camera. 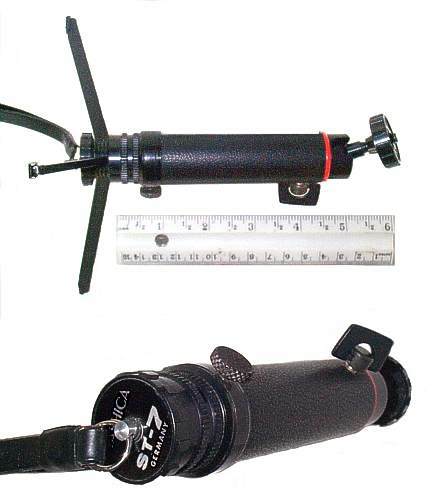 AUTO UP is an adapter that was introduced to enable close-ups within a range of 80 cm [32 inches] and 45cm [18 inches]. This range is marked on the front of the unit to remind you of the limits. The adapter attaches to the prime lens with a set screw which compresses a spring steel sleeve which grips totally around the lens, preventing the lens assembly from being damaged or marked by the set screw. The first image is of the G / GS / GSN model and is finished in satin chrome to match the camera. The lower image is of the model for the GT / GTN, which matches that camera's black finish. Both images are provided and © by Lynn Sellers. If you intend to complete or start a collection, seek out the Auto Up matching your camera. On the other hand if you intend it for purely practical use, the black finish is less likely to reflect light. It is open to question whether this is critical in view of the precautions that need to be taken to prevent unwanted light from reaching and reflecting off the massive amount of glass which is part of the Auto Up. Some models of the AUTO UP lacked the Target which we can see etched in the center of the second image. Among the scarcest of all the Yashica Accessories is the Yashikor Tele - Wide angle Adapter designed exclusively for use with the MG-1. 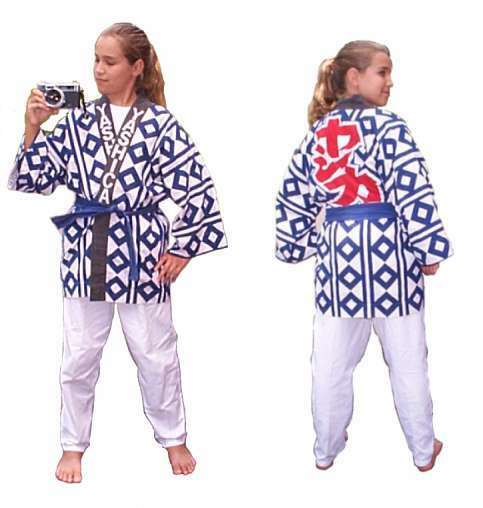 I have been scouring Internet auctions for ages, and had never seen one of these outfits on offer, and was unaware of their existance until I received these images from Lynn Sellers. This set was purchased in the UK and it is possible that they were not even exported to many countries by Yashica. The Lenses have a cut-out which enables the light sensor located in the MG-1 lens group assembly, to accurately meter the subject brightness without interference. Shown below are the more familiar Yashikor supplementary Wide -Tele Adapters with a 55mm screw-on thread that fit and will focus correctly using the required conversion scale, when used with the Electro 35, G, GS and GSN [chrome or black cameras]. The Tele Wide Adapters shown elsewhere on this site were produced in Japan. This outfit was made in Hong Kong. It would be fair to assume that the optics themselves were imported from Japan. An instruction pamphlet in English only is included. These lenses would not focus with any other lenses that I tried them on. If you already own a set, you could try them with other camera lenses if the thread happens to match, but don't go out and buy a set with the thought of using them on a camera other than the model that they were designed for. A required finder is mounted in the flash shoe and reversed for the Wide or Tele view. The case is made of a composite material instead of the original leather. A major hassle with these lenses is misplacing the view-finder or buying a set and finding that the required view-finder is not included. Fortunately, there is a good chance that if you cannot find the Yashica Set on internet auction, you will be able to find the second party issue from Suntar for the 'G' series or Kaligar for some of the earlier cameras. This may be the cheapest way to get a missing finder. As a last resort, you can get very close to the field of view of the Wide Angle lens by sighting to the extreme outside limit of the camera's own viewfinder. A close match for the Tele is obtained by sighting to within an imaginary line inside the frameline that is at the same distance as the space between the outer limit and the frameline as before except ...inwards. For more details on these lenses, visit the Tips and Q & A section of this site. The images and receipt were provided by Lynn Sellers. This outfit was purchased in 1983 from Service Merchandise for $59.97 US. Receipts from any part of the world for cameras and accessories on the site would be appreciated for the historical record . Email a scan or Xerox by snail mail please. 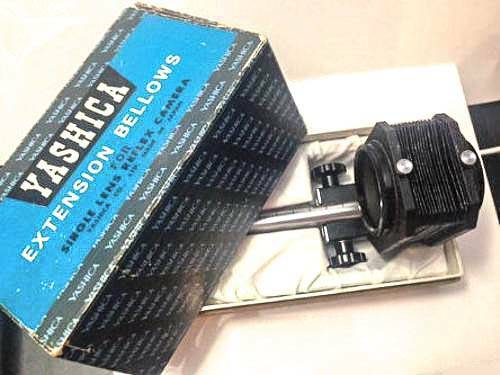 The Yashica Bellows was most likely fabricated by a third party as is the case with the Mini Tripod. This accessory is only for use with SLR cameras but is included here because it may be the only published reference that people can avail themselves of. Designed originally to extend the lens in order to focus on macro images, I have used the Bellows primarily to attach ancient very long focal length lenses like 5 X 7 format cameras as the Graflex. Some of these Oldies make superb portrait lenses. One end of the bellows can fit adapters to a specific camera mount and the other a "T" mount for lenses, although a rigid home made cardboard adapter painted black will serve quite well. Last but not least, from the Yashica Guy collection, one of my granddaughters, "Natasha" models the authentic Yashica Happi Action Jacket. The characters on the back of the jacket spell "YASHIKA".